The newest trend among homeowners, especially in Surrey, Sussex and the London area, is to replace their outdated bath and shower combination with a separate bath tub and corner shower enclosure with frameless glass. Until now, most bathrooms usually feature a combined bath and shower. This is practical and offers you the option of taking either a bath or a shower in the same space. However, while it can be ideal for families with young children, it can pose difficulties for older people or those with mobility problems. When you are redesigning a bathroom, it is important to think carefully about your potential future needs as well as your current requirements. If you can accommodate both a separate frameless glass shower enclosure and bathtub it will be a worthwhile long-term investment. First think about every possible configuration for your bathtub, toilet, basin and shower. It’s surprising how much you can actually squeeze in, especially if you fit a shower with a bespoke frameless glass design. Frameless glass can be cut to fit any size or shape and will maximise the light and make the shower enclosure less visible. You can position a shower enclosure or screen almost anywhere, as long as your plumbing allows it. We recently designed and installed a frameless glass shower enclosure for in an area of a bathroom which was previously a cupboard for a homeowner in Surrey. To create extra space you could consider moving a wall or a window. Or it might be something as small as changing the way a door hangs that might have the most impact. Underfloor heating could free up more space too. With a custom-made frameless glass, it’s possible to fit a shower enclosure under a sloping roof. This is because the glass can be cut to fit the space perfectly in a way that would be impossible with a metal frame shower. The traditional shape for a shower enclosure is usually square, but a pentagonal, triangular or slim rectangular design could be the perfect solution using custom-made frameles glass. This photo shows a space-saving frameless glass pentagon enclosure. It resembles a square with one corner cut off. Losing one of the corners of your shower won’t make much difference to how your shower feels when you’re standing inside; but it will save valuable floor space. Showerpower is the UK’s foremost frameless glass specialists; producing and installing bespoke panels and doors for showers in all kinds of challenging layouts. 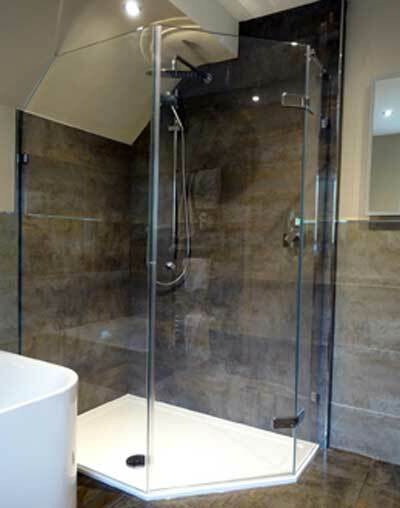 You can learn more about our made-to-measure frameless shower screen service here. We would be delighted to advise you on designing and installing a made to measure, frameless glass shower enclosure. You can read more about our bespoke service here. Or why not get in touch today to discuss your requirements? You can contact us online or phone us on 01403 829020.